Performance is the key factor for any successful data integration project, knowing the type of transformation that you’re using is the first step on optimizing the SSIS flow performance, by utilizing the correct transformation or the design alternative technique you could gain much more performance out of your SSIS flow. The recommendations and suggestions below represents real life experience and excerpts from the Microsoft Technet article : http://technet.microsoft.com/en-us/library/cc966529.aspx along with influence from the other links referred to at the bottom of this Article. While this Article presents a summary and major points to focus on from those resources, you are encouraged to follow the links for more specific and in depth discussion. SSIS (SQL SERVER INTEGRATION SERVICES) is using a buffer-oriented architecture to efficiently load and manipulate datasets in memory, the benefits is avoiding the I/O to the disk and physically copying the data to the disk, and therefore it’s transferring the data from the source to the destination through the pipeline without touching the disk. As this data flows through the pipeline, SSIS attempts to reuse data from prior buffers as much as possible when additional operations are performed. How buffers are used and reused depend on the type of transformations that you use in a pipeline. These process the data in Row-by-row basis, Row transformations have the advantage of reusing existing buffers and do not require data to be copied to a new buffer to complete the transformation. • Do not block data flow in the pipeline. • Data is not copied around, only pointers. Are often used to combine several datasets. They tend to have multiple data inputs. As a result, their output may have the same, greater, or fewer records than the total number of input records. • Introduces new buffers in memory layout. • Transformed data is copied into new buffers. 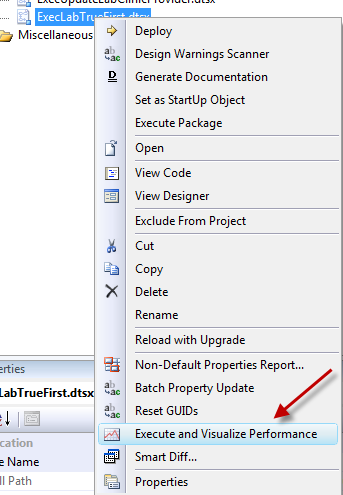 Blocking transformations must read and process all input records before creating any output records. Of all of the transformation types, these transformations perform the most work and can have the greatest impact on available resources. • Must see all data before passing on rows. • May also use “private buffers” to assist with transforming data. 1-You could monitor and observe the performance using the PROGRESS tab, while running the package, it’ll tell you when the task started, ended and how long it’s taking to finish, which would be a great way of discovering which tasks is pulling the performance down. It offers whole new features for the BIDS environment which would help you such as deploying your packages, dtsConfig file formatting and SSIS performance Visualization which I’ll cover now. 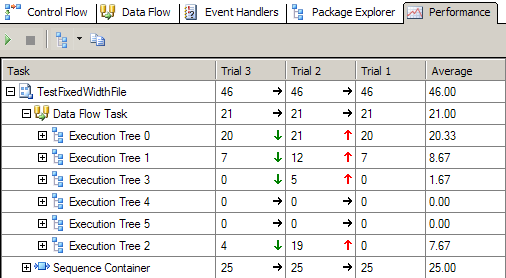 Using the SSIS performance Visualization is simple, you just right click on your package after installing the BIDS HELPER and you’ll have new options, you need to select “Execute and Visualize Performance”. You’ll be introduced to another screen with Performance Tabs, and you choose to visualize the performance by looking at Gantt Bars, Statistics Grid or Statistics Trend, which compares the performance from one execution to another. It adds a new column for each execution and highlights whether the duration of that piece of the package was faster or slower than before. As I always say, everything is life could be done in many different ways; it’s just YOU who needs to decide which approach is better for you as it really depends on your environment and business requirements. I’m going to point some points that you’ll need to do more research and also included some links so you can look it up in more depth. 1-Remember is that synchronous components reuse buffers and therefore are generally faster than asynchronous components, that needs a new buffer. 4-Maximum insert commit size and Rows per batch has a great effect for not treating the whole incoming rows as one patch. • Use SELECT statements as opposed to selecting the tables dropdown. • Sort your query in the engine, or even using the SQL command in OLE DB Source instead of using Sort transformation. 10- If the SQL server is local, consider using SQL Server destination instead of OLE DB Destination. 11-Consider indexes fragmentation and performance when inserting high volume of data. 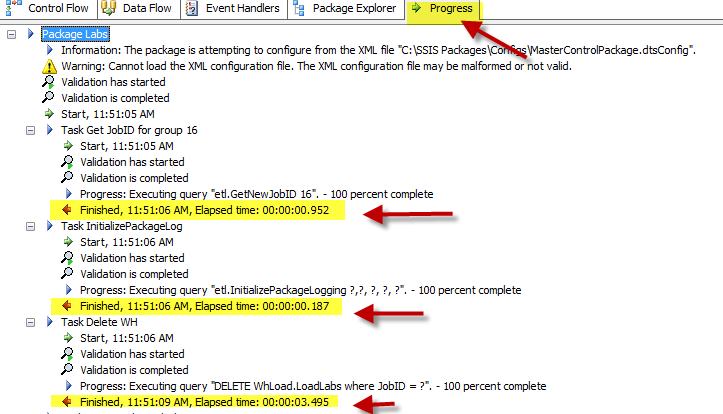 12-Use “Fast Load” when using OLEDB, it uses BULK INSERT and would be faster. 13-Optimize the packet size in your connection managers to 32K (32767) and that’s the fastest option. Thanks, 13-Optimize the packet size in your connection managers to 32K (32767) and that’s the fastest option. really helped.